Finland Ice Cream was the biggest of the three and held sizeable market share in the 1950s and 1960s. The firm was incorporated in 1950 and its founders Leung Kee-chai (梁杞儕) and Lee Kwai-cheuk (李桂焯) made their initial fortune in the auto parts business through their Kung Lee Hong (公利汽車材料) at Des Voeux Road and later on Hennessy Road. To launch Finland Ice Cream, they teamed up with Professor To Shue-tsoi (杜樹材), a US trained dairy expert. Born in 1899 and a native of Nanhai, To graduated from Canton Christian College (precursor of Lingnan) in 1922 with a degree in agriculture and furthered his studies at Iowa State in the US. Before coming to HK, he taught at Lingnan in Canton and Wuhan University. To produce high quality mango ice cream, Finland purchased whole milk powder from the US via Lane Crawford and mangos from the Philippines. In the 1950s, its main plant was located at 52 Yen Chow Street in Sham Shui Po with a branch factory was located at 197 Castle Peak Road and a distribution center located at 131 Hennessy Road in HK. In addition to ice cream bars, sandwiches and popsicles, they also marketed a soft drink under the Finland Cola (芬蘭可樂) brand. While its competitor On Lok Yuen chose to distribute its ice cream primarily through its own network of restaurants in prime locations next to theatres, Finland adopted the more aggressive approach of bringing the ice cream closer to its customers. The firm was not only a customer of Lightfoot refrigerators and Oster milkshake machines themselves but also acted as its distributor in Hong Kong, selling them to restaurants, nightclubs and diners. 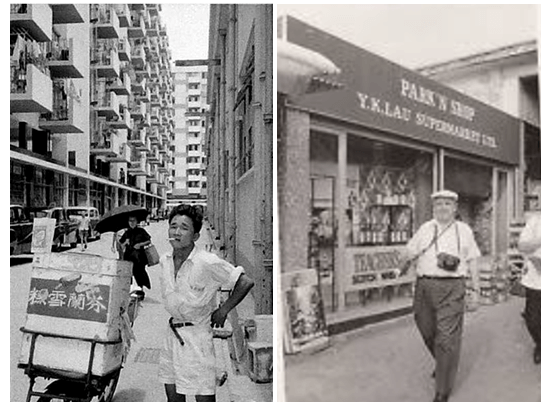 By installing hundreds of refrigerators in schools, stores, restaurants and diners across HK, Kowloon and New Territories and also doing home delivery to wealthy households in the Mid-Levels with their own refrigerators in the 1950s, Finland ice cream was available everywhere within a short period of time and captured significant market share. In the summer of 1957, Leung Kee-chai died suddenly at the age of 65 while visiting the Repulse Bay Beach with his family on a weekend. He was succeeded by his son Leung Nai-wing (梁乃榮) who proved to be a capable heir and took Finland Ice Cream to greater heights. 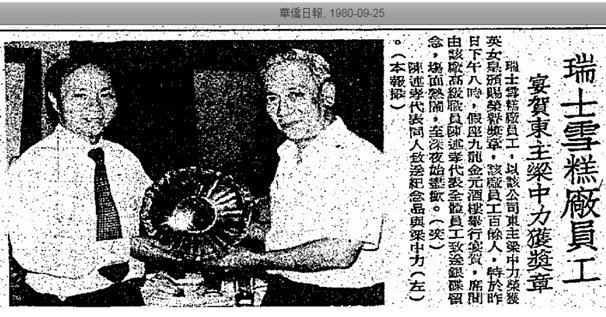 In 1963, Leung Nai-wing visited Japan at the invitation of the Japanese trading house of C. Itoh and came back with HK$2 million worth of state of the art equipment acquired from Mitsubishi Heavy Industries which were installed in its new plant in Kwun Tong. In 1964, Finland occupied one of the two biggest booths at the HK Products Expo – a 3800 square foot booth which featured a carousel and lots of toys for kids. At the time, it was making over 200,000 cups of ice cream per day (up to 300-400,000 in the summer time) and at the HK Products Expo alone was selling several tens of thousands cups of ice cream per day. 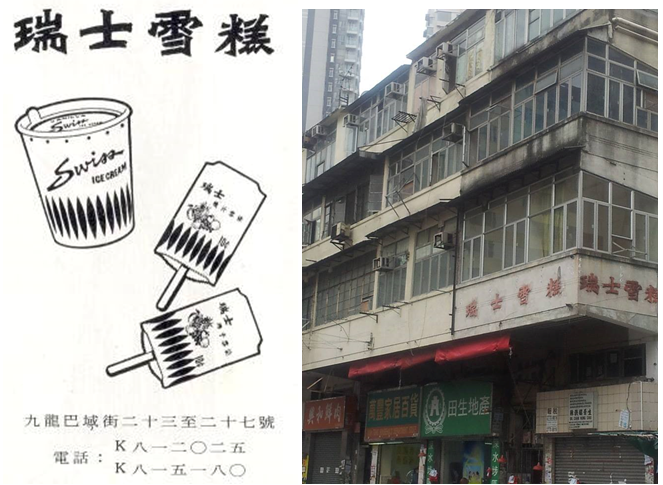 In August 1973, the A.S. Watson group acquired Finland Ice Cream including its 10,400 sq ft plant at 13 Chong Yip Street in Kwun Tong. At the time Watson was aggressively expanding beyond its traditional business of soda and pharmacies and just acquired Park N Shop supermarkets from Y.K. Lau (劉裕光) and Peter Pan Toy Shops. The rise of supermarket chains and increased penetration of refrigerators changed the dynamic of the ice cream industry in the early 1970s and it became necessary for Finland to sell to a firm with the distribution power of Watsons while Watsons needed to expand into ice cream to defend Park N’ Shop as Dairy Farm ice cream was only available at its affiliated Wellcome supermarkets. Instead of keeping the Finland brand however, Watson created a new one – Mountain Cream (雪山雪糕). The resulting company – Mountain Cream International Ltd became the leading ice cream maker in HK by the 1990s with 44% market share, partly thanks to its introduction of imported ice cream Dreyers in 1985 with sales of over HK$380 mil in 1995. Mountain Cream was acquired by Unilever in 1999. 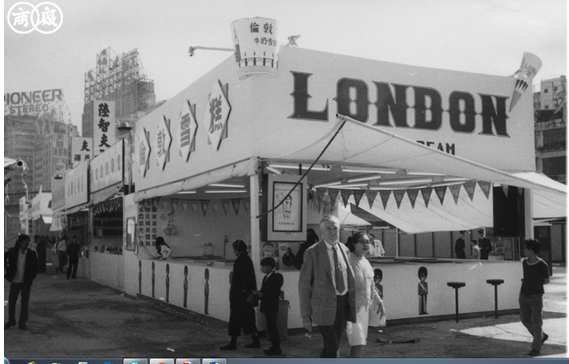 According to the Company Registry, London Ice Cream was incorporated in 1965 although it was likely founded earlier as its name appeared in a 1958 directory with Cheng Chen Wong listed as its manager and 12 Pennington Street in Causeway Bay listed as its address. By 1966, the manager of the firm was To Kwok- hay (杜國熙), who the year before was Kowloon sales manager of Dairy Farm. To was fined HK$500 by the government as the sample of London Ice Cream seized by the health inspectors revealed almost three times the legal limit of bacterial count. Aside from its location at Causeway Bay, the firm allegedly also had a store in the Kowloon side right next to the Royal Theatre (麗聲戲院) at 750 Nathan Road (present site of the Pioneer Centre) in Mongkok. The firm also sold its ice cream in refrigerators at retail outlets such as the Daimaru department store and First Market at Lee Garden in Causeway Bay and increased its exposure through participation in events such as the annual HK Products Expo organized by the CMA and charity sales organized by local kaifong welfare associations. 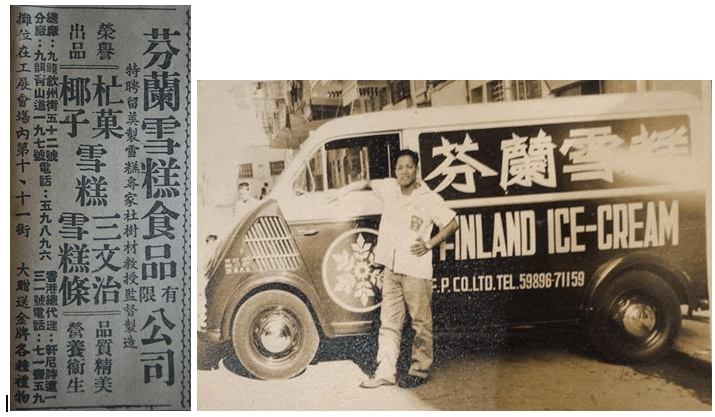 In the 1970s, London Ice Cream was acquired by Wai Kee-kau and Wai Kee-Nang, sons of the founder of Yee Tin Tong Medical Manufactory and brothers of Jack Wai and Wai Kee-shun who started Tin Tin Daily News. Wai Kee-kau (韋基球) was a civil engineering graduate from the University of Michigan who was involved in property development and was known for his leadership involvement with his alma mater Lingnan from 1958 until his death in 2013. Wai Kee-Neng (韋基能, aka Ken) received his Ph.D. in industrial pharmacy from Purdue University in 1963 and worked at ICI in the UK before returning to HK. Ken left London Ice Cream after several years to focus on consulting for food and beverage companies such as Coca-Cola. By 1985, the firm was operating out of 206-208 Choi Hung Road in San Po Kong. As a firm, London Ice Cream was dissolved in 2006. Swiss Ice Cream Co was incorporated in 1964 and was popular in the 1960s through 1980s. 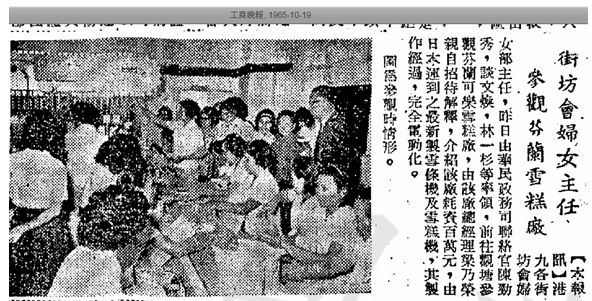 It was distributed through neighborhood stores in housing estates and through specialty food shops such as Yiu Fung (么鳳). The founder of Swiss Ice Cream – Leung Chung-lick (梁中力) was a native of Shunde in Guangdong province. 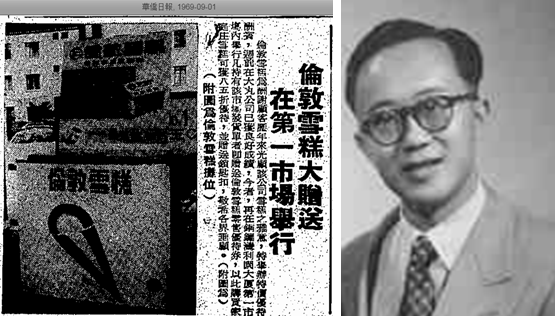 Outside of work, he was very active in community affairs having served as a director of Tung Wah Group of Hospitals in 1969 and on the board of Leung’s Family Association and Shun Tak Fraternal Association for which he was the founding supervisor of its Tam Pak Yu College. He was also vice chairman of the HK Life Guard Club (now HK Life Saving Society) for many years and in 1969, Swiss Ice Cream sponsored a lifesaving competition in Cafteria Old Beach. In 1983, he and number of his fellow Shunde natives donated a major hospital in their hometown of Shunde. Leung died in 1993 and Swiss Ice Cream was dissolved in 2002. The firm operated out of 23-27 Berwick Street in Sham Shui Po near Shek Kip Mei where its signage is still visible today although the firm is long gone. This article was first posted on 13th April 2018.